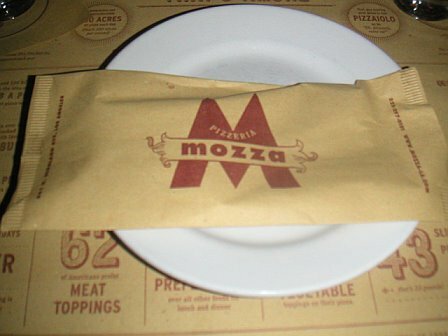 Pizzeria Mozza has held my attention since its opening in November 2006, for several reasons. It’s the first West Coast venture from celebrity chef Mario Batali and his longtime business partner Joe Bastianich. It’s also the result of an unusual collaboration between Batali and Nancy Silverton of La Brea Bakery. 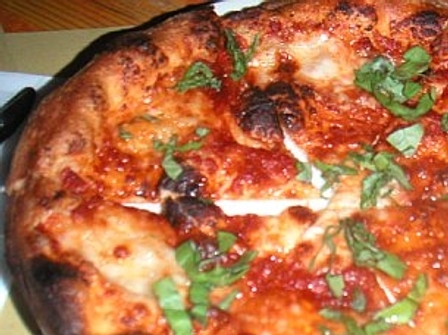 And on top of it all, the pizzeria emerged virtually unscathed by national reviews. I don’t make it down to Southern California often, so as soon as the slightest possibility arose that I might be in the vicinity, I called to book a reservation. After a series of prompts and several minutes of waiting patiently, I spoke with a hostess who was able to offer me a Saturday dinner reservation a few weeks in advance at the only available time slot of of 10:45. I took it. 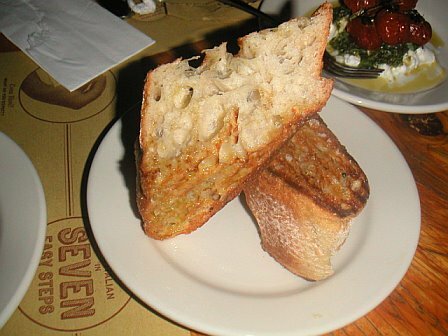 We opted to begin with the pane bianco bruschette (oven-roasted bread topped with olive oil) served alongside a Caprese salad. I’m not sure why the single slice of bread needed to cost $3, but the salad completely made up for it. While a traditional Caprese is made with fresh plum tomatoes, Mozza managed to take it to another level by using vine-ripened cherry tomatoes and slightly roasting them. 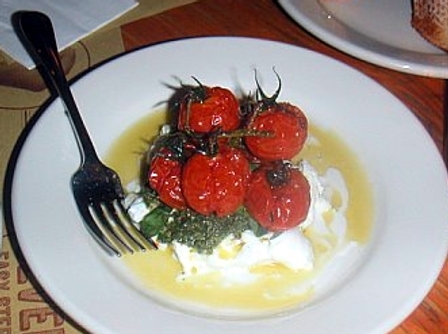 The result: A sweeter, richer depth of flavor that married perfectly with the mildness of the mozzarella. The squash blossoms, a popular dish in Mediterranean kitchens, arrived stuffed with ricotta and mozzarella cheese, then breaded and fried. The portion was somewhat undersized, but the crispiness of the squash blossoms, combined with the airy ricotta filling, was outstanding. The antipasti offerings were solid, and I would certainly go back to try more of them — the salt cod bruschette, cauliflower gratinate, arrancine and bone marrow al forno are all on my list. With a few exceptions, like the margherita, many of the restaurant’s offerings were a new take on traditional pizza combinations. 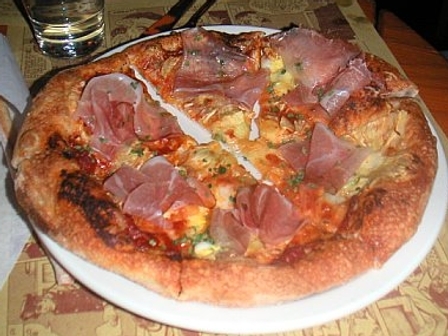 The pizza alla benno was a Hawaiian-style pizza with speck prosciutto instead of ham. The pizza had a bit of a kick with the addition of jalapeño, which was a great substitute for the standard crushed red pepper — I would have liked even more of it. Overall, it was a nice take on the Hawaiian, but could have used a bit less pineapple as it was a tad too sweet. 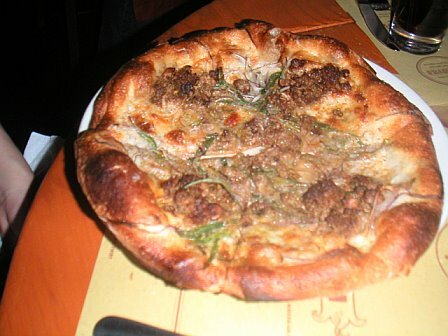 The best pizza of the night was the fennel sausage pizza. Arnold of Inuyaki called it a must-try, and it truly is: The sausage, which is made in-house, possessed a sweet-spicy anise flavor had me yearning for more. Just when we thought we were completely satiated, we were handed the dessert menu. Everything sounded so delicious that we proceeded to eat what could be considered another meal’s worth of desserts. Our waitress said she concurred so much with our dessert selection that she wished she could pull up a chair and enjoy it with us. 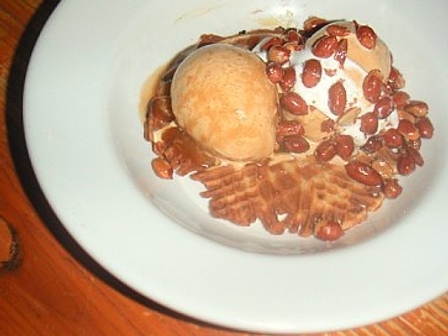 The first dessert I tried was a glorified sundae, with caramel gelato atop a caramel wafer, drizzled with caramel and marshmallow sauces, and sprinkled with salted Spanish peanuts (skin still on). The dish provided a stark contrast between the savory and the sweet. 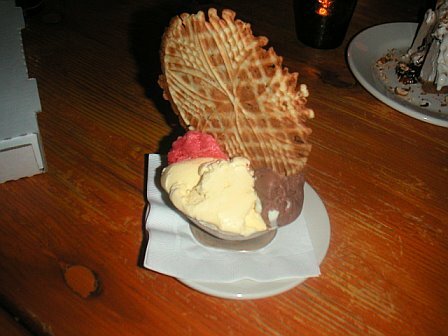 I loved the crispy, chewy wafer combined with the melting gelato as well. My only complaint was that the peanuts were a bit overpowering in the dish and should have been chopped into smaller pieces — because they were still whole, I felt a bit like I was snacking on gorp. 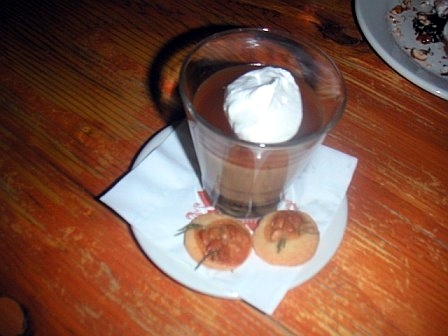 Our server sang the praises of the butterscotch budino as the restaurant’s can’t-miss dessert. She was spot-on: The pudding was an Italian rendition of dulce de leche, topped with thin layer of caramel, a dollop of cream and a pinch of sea salt, and fennel cookies on the side. The accompanying fennel cookies didn’t add anything to the dish and seemed to distract from the pudding, which was light, smooth as butter, and indulgent in a way that was not overpowering. While I was prepared to find an assortment of gelati and a budino on the dessert menu, I wasn’t expecting to see a bombe. 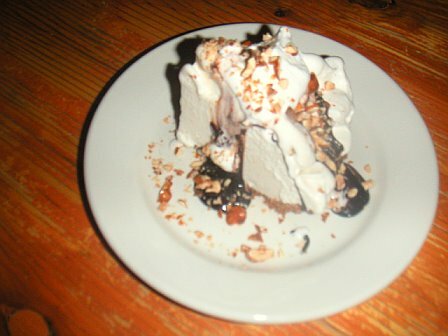 The banana gelato pie was a refreshing detour from the typical Italian dessert menu (please, no more panna cottas!) and possessed the authentic banana flavor that is both mild and strong at the same time. Since I was so in love with the olive oil dessert at Pizzeria Picco, I leaped at the chance to try the assortment of frozen offerings. We opted for a blood orange sorbet, which was tart and slightly cloying; a hazelnut gelato, which was not too sweet and reminiscent of roasted nuts; and the olive oil, which tasted more like vanilla with olive oil mixed into it. The olive oil gelato paled in comparison to Pizzeria Picco’s Da Vero-drizzled soft-serve. Eating at Pizzeria Mozza, I couldn’t help but wonder how much Batali and Silverton were influenced by Bruce Hill, the chef and owner of Pizzeria Picco, whose pizza Batali swore was “so good, it’s enough to make you cry.” While Hill is certainly ahead with his olive oil soft-serve, Pizzeria Mozza might just take the pie…pun intended.